Model Sally Ferreira has filed a lawsuit against 50 Cent for putting her on blast on his Instagram and allegedly "blacklisting" her from the industry. 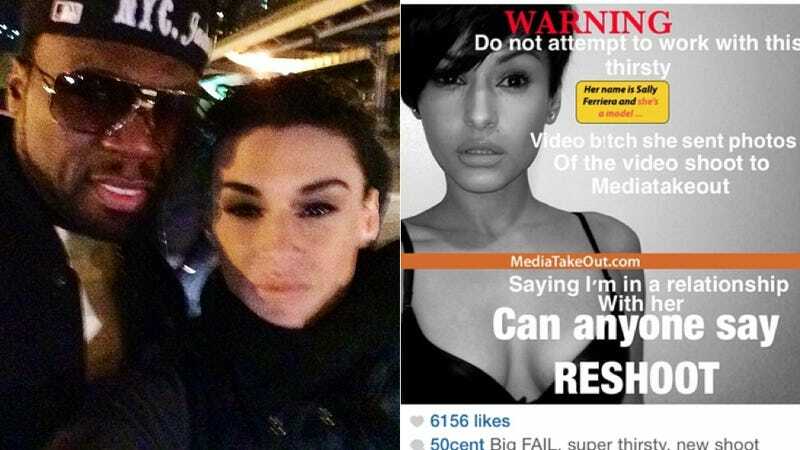 After Ferreira and Curtis Jackson filmed scenes for his music video "Big Rich Town" on the 4 train in the Bronx (for which 50 did not have a permit, tsk tsk) at the end of March, 50 got upset because photos from the shoot ended up on the sites like Mediatakeout. He then took to Instagram, blaming Ferreria for the leak and claiming that she was trying to get people to think they were together, before deleting the post shortly after. (50's post was doctored to look like a Mediatakeout picture, so I suppose he gets credit for creativity.) Those photos and photos of the pair on Ferreira's Instagram (which have since been removed) sparked rumors that the two were an item. Before the suit, 50 and Ferreria were chummy; they'd worked together on his movie Gun and she's was in two of his past videos as well, "OK, You're Right" and "I Like The Way She Do It." In the complaint, obtained by sites like New York Post and the Daily News, Ferreria says that she "was working on three separate entertainment industry projects and enjoyed a good reputation in the industry," before 50's post. But "[a]s a direct and proximate result of the defamatory posting and the subsequent media fallout and negative publicity surrounding Ms. Ferreira, as of the date of this filing, all three projects have been put indefinitely on hold." "Moreover, as a direct and proximate result of Mr. Jackson's actions, Ms. Ferreira has been subjected to harsh and hurtful comments about her profession, character, and appearance, causing her severe emotional distress," the complaint says. It also notes that 50 "had no factual basis" to write what he wrote and that he's put Ferreira under "ridicule and scorn" – especially because she has fiancé whom she's been with for nine years. It's unclear exactly how much money Ferreira is asking for; the Post and the Daily News have reported different sums of money ($11 million versus $5 million). In any case, Ferreria's keeping her head up: her social media presence recently has been full of aphorisms about karma, tough times and negative energies.